I’m not much of a sports fan, but after being married to one for 13 years, a few terms have rubbed off on me. A “hat trick” in hockey is when a player scores three goals in a game. 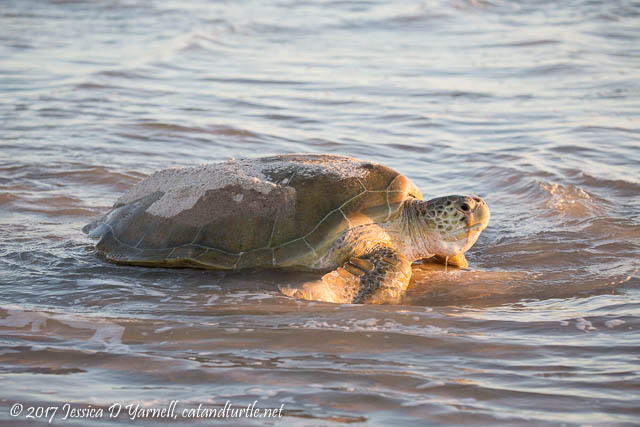 When applied to turtles, it means that Rich saw three turtles on the beach on one mid-July morning! We got to the beach at 5:45 that morning. 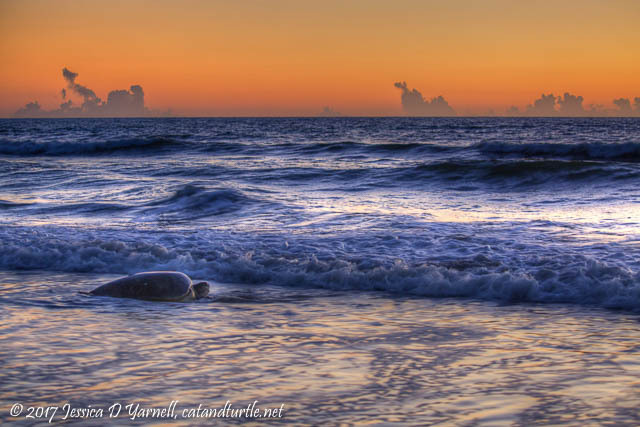 It’s not often that Rich gets up that early – only for turtles! 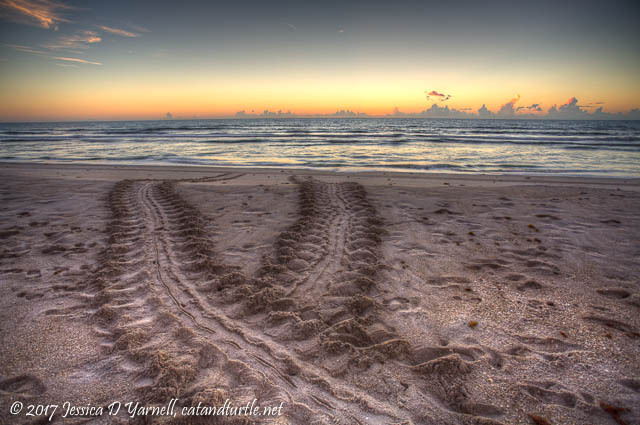 It was wonderful to step out onto the sand as the first light of the sun was just beginning to warm the sand. It wasn’t too long before we spotted our first turtle as she re-entered the water. Here’s a close-up of that same turtle. 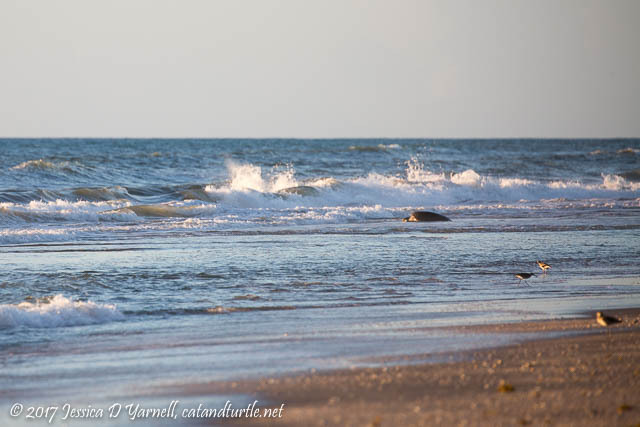 The light was very low still, and I loved how the water blurred around her head as the waves welcomed her home. 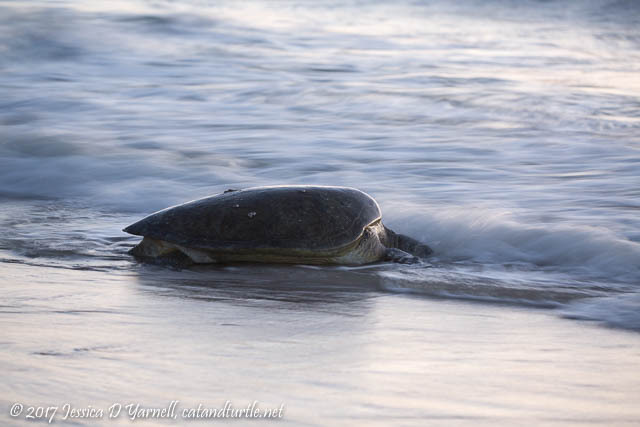 Here are the tracks left by this turtle, first as she emerged from the ocean, and then as she returned. The outside of each “tread” are the marks left by her flippers as she pulls herself along. The long, thin line down the middle of each track is made by her tail. You can see the glow of the sunrise as the clouds lit up with the light of new day. A few minutes later, the sun showed itself over the horizon. 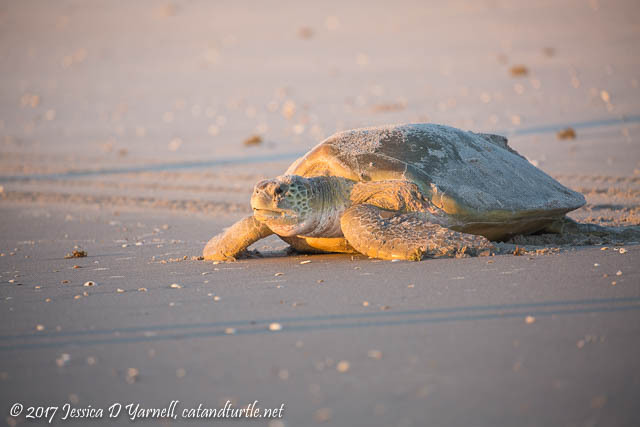 We continued along the beach, and soon we saw another turtle making her way down the beach. She had already laid her eggs and was halfway back to the ocean. We ran to catch up to her before she re-entered the water. The poor turtle was covered in sand. She seemed to breathe a sigh of relief as she reached the water and the waves washed the sand from her face. 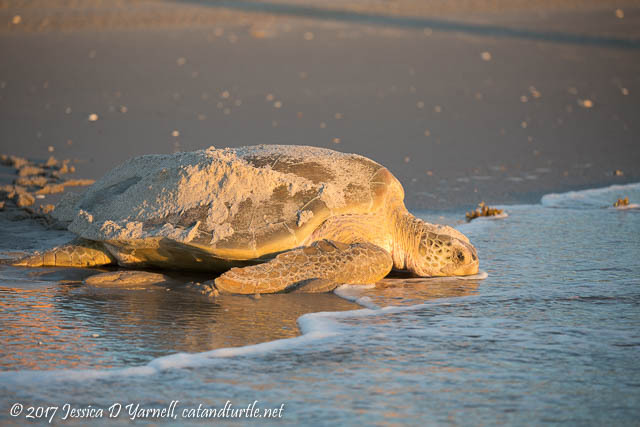 On our last visit to the beach, we saw a turtle missing a flipper, and it took her a long time to get herself maneuvered back into the water. This turtle moved quite quickly by comparison. This was the last photo I took before she swam off. I walked back up the beach to see the nest the turtle had just made. Buried in the sand are her eggs, which will hatch in about two months. 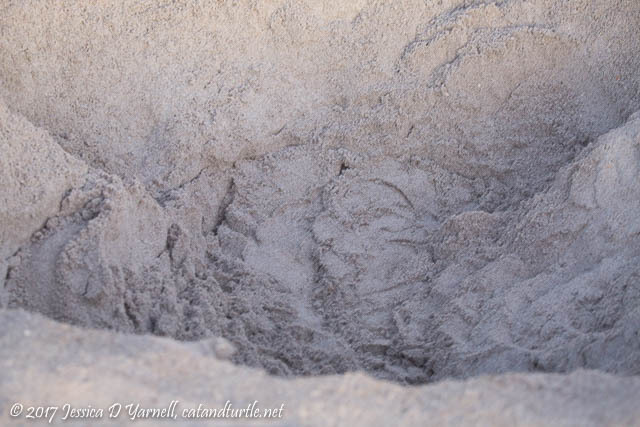 It’s amazing how big a hole the turtle can dig on dry land when she’s spent her whole life at sea!